I love the Review Request thread. I haven’t said so yet, however I’ve been listing out all of the requests in a separate file that I always have access to. And while I haven’t followed up on many of the requests (I think 3? 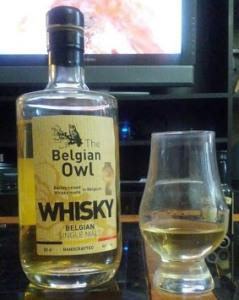 ), I did promise Belgian Owl Single Malt to /u/UncleTobys , and I have been reviewing other things, which has been making him cry. And as any Canadian will tell you, having an Aussie cry only is fun for about a month. So here’s the Dram that nearly had security called on me. Here’s hoping it was worth it.